I was recently sitting with a customer looking to buy a fiberglass swimming pool and the classic question came out. Any vessel, underneath the ground, can float with enough water pressure pushing on it. 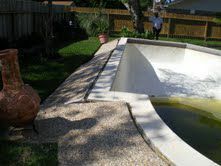 Of all types of pools, concrete/gunite pools are the most likely to float, as you can see in these photos, all of which are concrete/gunite pools. Fiberglass pools, although potentially could float if they were empty of water or had no concrete decking bond beam, almost never float. After having literally installed a few hundred pools on the waters of Virginia and Maryland during our time in business, we have not had one of these pools pop-up or 'float' after installation. 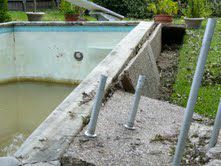 In fact, the only case that typically leads to hydrostatic issues with a fiberglass pool is when they are drained/emptied of their water, which is an absolute 'no-no' and can cause, instead of the pool floating, the pool's floor to buckle or crack. 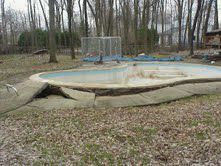 Such can be repaired, but is obviously not a good thing, which is why fiberglass pools should always remain full. As always, happy swimming to everyone and if you have any questions or comments, please don't hesitate to leave your thoughts below.